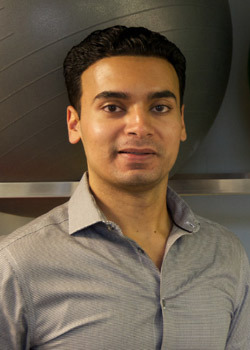 Dr. Haider Rizvi earned his Doctorate in Physical Therapy (DPT) in 2009 from Seton Hall University. He has since been practicing outpatient orthopedic rehabilitation and is experienced in various areas of PT interventions including pediatrics, neurological conditions, post-operative care, injury prevention & wellness and work-related injuries. Dr. Rizvi, a hands-on clinician who practices with the Maitland method of manual therapy, is a Certified Orthopedic Manual Therpist (COMT). The Maitland approach to Clinical Reasoning is widely considered one of the cornerstones of modern day Orthopedic Manual Therapy. Few philosophies of manual therapy can claim the same level of commitment to the patient’s values and well-being. Dr. Rizvi is also a Certified Strength and Conditioning Specialist (CSCS), a professional that applies scientific knowledge to train athletes for the primary goal of improving athletic performance. They conduct sport-specific testing sessions, design and implement safe and effective strength training and conditioning programs and provide guidance regarding nutrition and injury prevention. His current practice incorporates several holistic and natural healing services including chiropractic care, acupuncture and massage therapy. The Department of Rehabilitation utilizes various therapeutic treatments to assist in strong patient outcomes. Much of this involved Kinesio Taping Method, Mechanical Cervical/Lumbar Traction and Graston Technique.